It had to happen eventually. 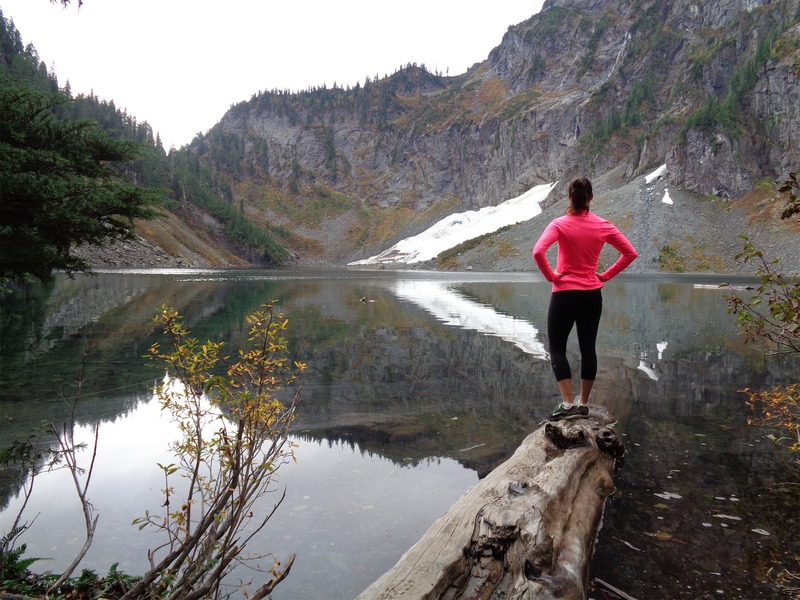 Lake Serene is a hugely popular hike out here, which is probably why I avoided it for so long. I’m more of a remote hike type apparently, which was surprising to learn given that I work retail and generally love people. Maybe it’s the break that adds to the experience, who knows. Anyway, here we go. 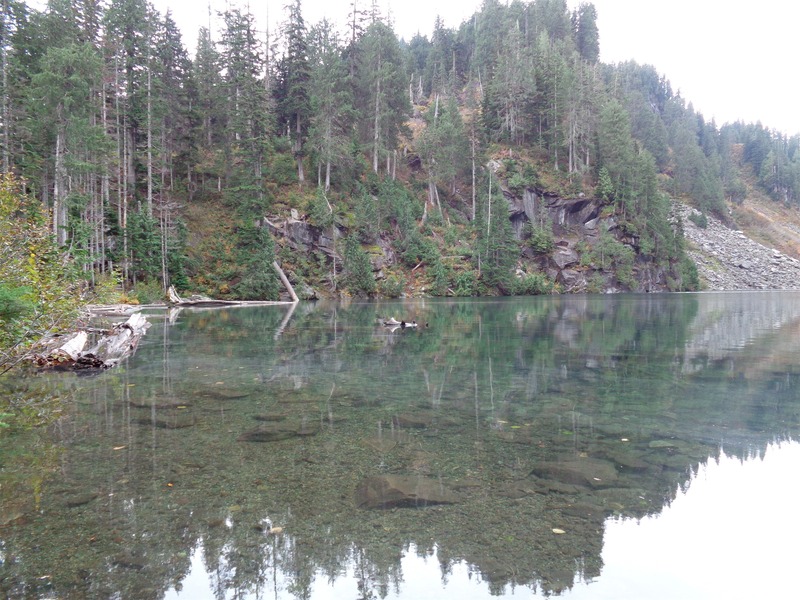 Lake Serene, hiked 10/25/2014. Did I trip: Hell no. Get at me. I had been in my apartment for too long, and decided to go on a rainy day hike up to Serene, which was supposed to be great even on overcast days. Since it was lousy weather and pretty late in the season, the hike was relatively empty, and I only ran into five or so other hiking parties. Here’s my favorite picture of the lake. Nice and clear and turquoise. The first part of the trail is a wide, pretty flat gravel path for about a mile. Not too exciting, but hey, there’s a destination to look forward to. You’ll pass this neat little waterfall pictured on the left, which isn’t the big falls, but I thought the rocks were too cool to pass up. 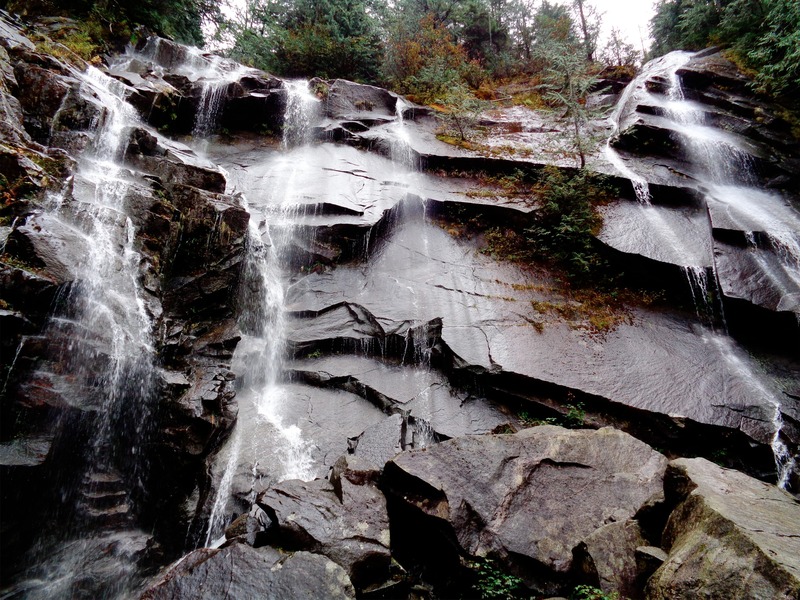 At 1.7 miles, the trail splits to either Bridal Veil Falls (another half mile) or Lake Serene, which is another 2.9 miles. Honestly, do the falls first. I (and another hiker) both did it second, and agreed that while it was totally worth it, we almost didn’t do it since when you’re so close to the end it’s tempting to head straight back to the cars especially on a rainy day. Seriously, it’s such a quick side trip, just do it! After the junction that leads to the falls, the trail to Serene starts to get serious. At first it’s just dirt with a few glimpses of views. 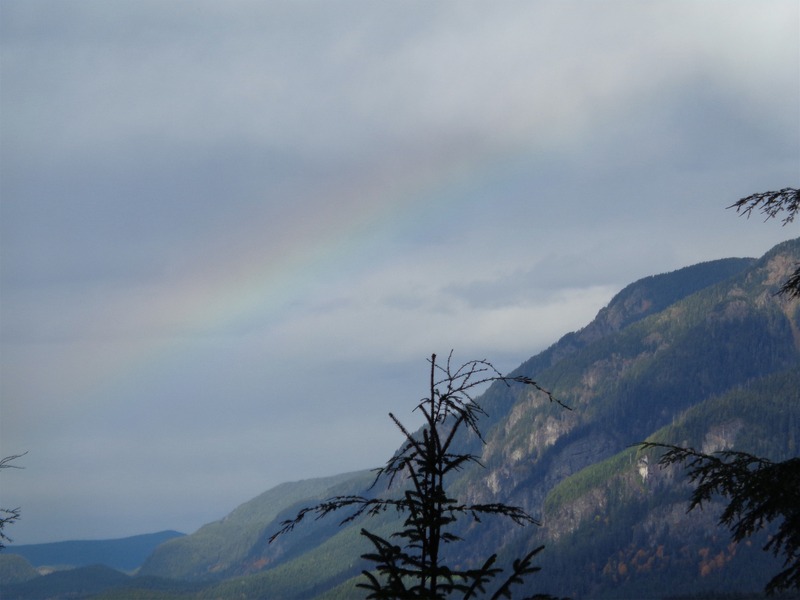 I was lucky enough to see a rainbow! I yelled to the group behind me but I don’t think they were as excited as I was. Sorry guys, that was like my fifth rainbow in two days which is just ridiculous. 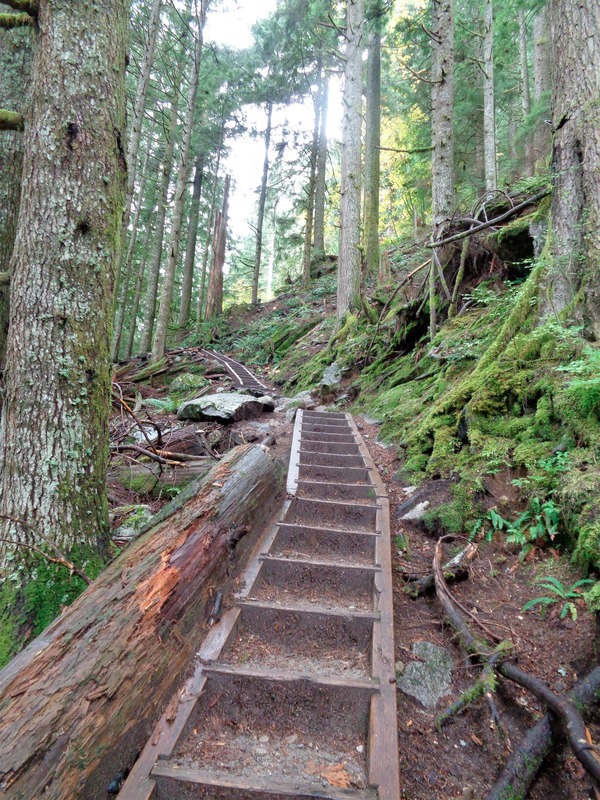 Anyway, the trail is very well taken care of, and most of the steep parts have been converted into stairs, so it’s more of a stair workout than a hike. But if you haven’t been doing much vertical, it might be a bit of a thigh burner. I met a mother hiking with her son and their dog who wasn’t sure how far she had gone, and she was exhausted. She asked how far we were from the lake, and I figured we couldn’t be more than half a mile, which she wasn’t too happy to hear. Half a mile of stairs in the rain is a long half mile. Turned out, we were like 5 minute away! I ran into them on my way back down (I spent longer at the lake than they did) and was glad to hear they made it. After all of the stairs and steep parts, you pop out onto a talus slope (kind of) and the lake is right around the corner. Definitely go to the look out rock, which is a big sloping rock that I imagine people picnic on when it’s not raining. The rock has far better views than anything else I saw. There were a couple ice caves on the other side of the lake, one of which I saw collapse! Damn! I know they’re cool to go in but make sure they’re stable first! It started to rain shortly after I got to the lake, so I turned around to head back down. This is where I started losing the motivation to check out the waterfall, but so many hikers on the way down told me it would be worth it. I chose this moment to realize I hadn’t put my parking pass up on my dashboard ([resulting in a string of expletives]), and could be returning to a hefty fine when I got back to the car. Race against time and hope I beat the park rangers, or assume I already blew it and go to the falls? I chose the latter, and like I said, totally worth it. 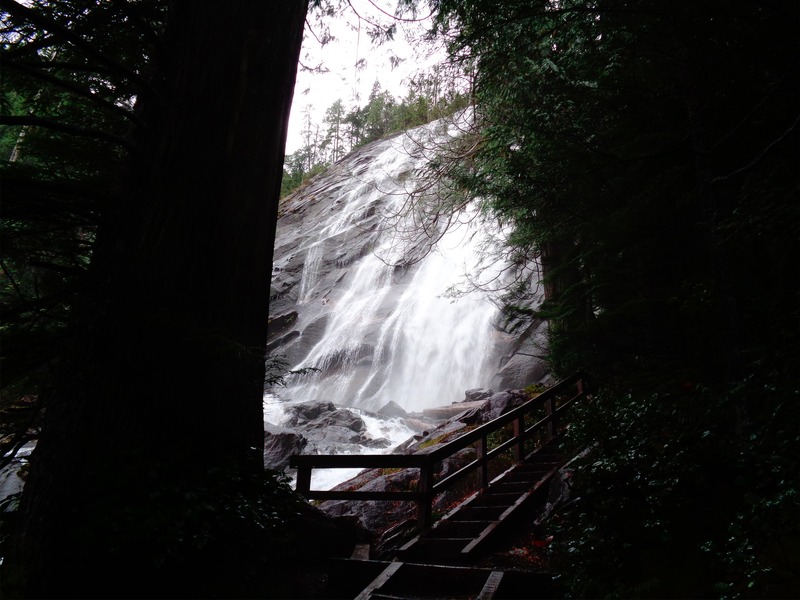 It’s an extra 15 minutes to see an awesome waterfall, which soaked me more than the rain did. You’re already there, it would be silly to not go. I swear it’s far more impressive than the picture makes it look. I couldn’t find an angle where the camera could capture all of it and not get absolutely drenched. Overall, pretty good rainy day hike, and definitely a hike I’d recommend for families. Maybe runnable on a more dry day. The first two miles or so were runnable, but the stairs were a little slippery, and I’m clumsy. 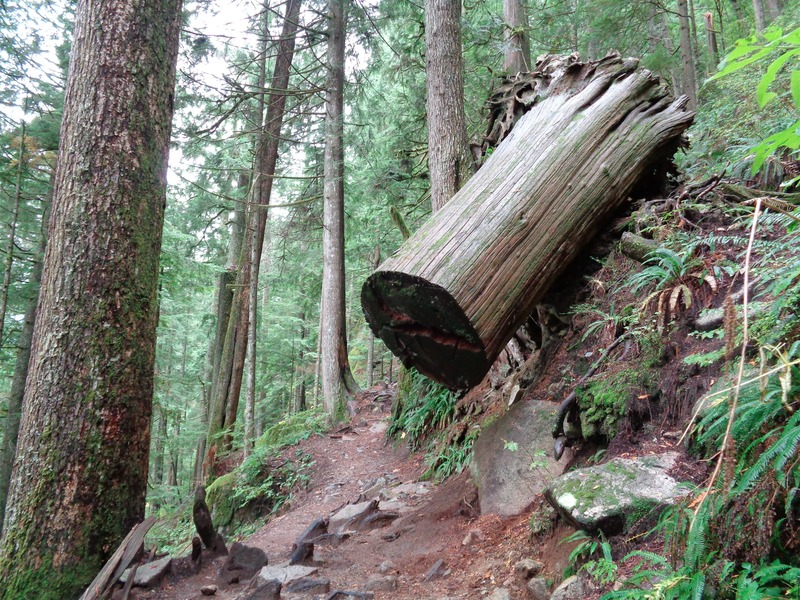 As a parting picture, here’s an awesome log precariously balanced over the trail. I should have stood next to it for scale, because it’s easily three or four feet in diameter, which you can’t tell by looking at the picture. Oh, one thing I forgot to add. Someone had left a “missed connection” note on the trailhead sign. A romantic letter to the “ginger he thought about for hours” signed with his name and number. Wonder if she ever saw it. Worth a try I guess? Or maybe he’s just getting texts from random people who saw the note. Ha. You should hike in Iceland if you like waterfalls and ice caves. How long did the roundtrip take you?